We are a prominent manufacturer and exporter of PP Hollow Profile Sheet, which is a doubled wall profile extrusion that is joined by series of vertical ribs. Being versatile, our PP Hollow Profile Sheet is used for various industrial applications. 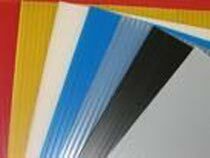 These PP Hollow Profile Sheets are widely used for packaging of vegetables, fruits, fish & plant, glass and Pharmaceutical .